"Mankind's next step will be our greatest." Well, this is interesting. We haven't heard or seen any official announcements yet, however theaters in Los Angeles are selling tickets for 8PM shows of Christopher Nolan's Interstellar starting on Tuesday night, November 4th. Up until today, Interstellar has been officially scheduled to open everywhere on November 7th, and we expected them to run late night/midnight shows the evening before. However, these listings are a full three days early, occurring Tuesday night (for midnight) with the full opening likely on November 5th. So far these listings are only for IMAX theaters, which means this could be an IMAX event to fuel (a few days early) the launch of this cinematic experience. Update! All early tickets are available now - visit the official website to find tickets for your location. It was revealed last week that IMAX's flagship TCL Chinese Theatre in Hollywood will be installing a special 70mm film projector just for Interstellar. We're currently waiting for IMAX's final list of cinemas showing Interstellar on 70mm film, which may be included in a bigger announcement waiting to hit. We've also sent an e-mail to Paramount for confirmation on exact plans. From the looks of it, select IMAX screens around the country will start showing Interstellar at 8PM on Tuesday, November 4th, three days before the actual release. This is the best way to see the film anyway, now it's just a matter of getting your tickets before they sell out. Stay tuned for additional updates / details on exact IMAX plans. Or if you live in LA – book now. Update!! This early release has now been confirmed officially via press release after the new trailer launch. "The advance showings will play in select theaters in more than 225 locations across the U.S. and Canada." Tickets are on sale now - get yours here. You can also find full theater listings and a guide to when/how to see the film in the format you choose via their official website. 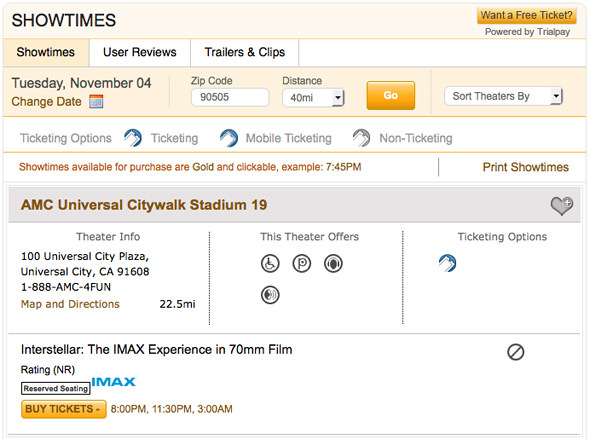 Most early locations are now selling tickets, so check Fandango as well for your local IMAX cinemas. This is one you don't want to miss seeing in the best way possible on the biggest screen possible. All 8PM tickets are available now and selling out very fast. I don't think tickets are on sale yet. In time... I saw a note saying tickets will be on sale around October 10th for the BFI IMAX in London, so I expect the same for most IMAX theaters (in a few weeks). Right now I think these two locations listed tickets way too early (before the studios could even make an announcement) and everything will follow suit once it's made official. They're coming soon, don't worry. Ok cool, I'll check back in a few weeks. The city location for the AMC theater I mentioned has a "true" IMAX screen, so I hope and I think they will get an advanced showing for Interstellar. I just need to see the tickets going on sale to be certain! Tickets in America are going on sale on the 1st. Also IMAX will be releasing the list of the 50 IMAX screens that are playing Interstellar in 15/70 and trailer 4 is coming. It's gonna be crazy today! And there you go! Yes, I heard new trailer tomorrow. Should be awesome, will keep everyone updated.